In 2018, we decided to play a more prominent role in the O’Reilly Fluent Conference. As you may have seen, we held a contest that offered a free pass to this incredible opportunity. After sifting through a month’s worth of entries, Jacqueline Ta was chosen as our winner. Jacqueline is a full-stack developer for myStrength in Denver, Colorado. She has a passion for building great technologies that make a positive difference. She is experienced in all aspects of the Agile development process and enjoys collaborating with product owners and designers to develop new products or features. Check out our interview with Jacqueline to learn more about her developer journey and why she entered the #grapecityfluentgiveaway. How did you first become interested in web development? "I came to development from a non-traditional background. I was a liberal arts major, looking towards a career in finance. After realizing I would need an MBA to really advance, I switched to a job as a junior mainframe programmer. The company trained a group of us in the software development process, as well as technical skills. I found that I have a knack for translating user requirements into code. After a few years on the mainframe side, I switched to their web development team. The rest, as they say, is history. " What are your favorite frameworks to use? Which platforms do you prefer? "For front-end, I love vue.js. It uses the best ideas from Angular 1.x and React, with great documentation and tools. On the back-end, Node.js is super fun for getting started quickly, but I prefer .Net or Java for API development in general." Why are you interested in attending this year’s O’Reilly Fluent Conference? "I am looking forward to learning new techniques and skills for improving web performance (especially offline) and building software more efficiently. Fluent is known for having a strong lineup of speakers. Besides the keynotes, I always look forward to meeting new people who’ve encountered similar challenges and sharing our experiences. " What are you hoping to take away from the conference? "I hope to learn enough about some new technologies that I can bring it back to my day job. I especially look to get tips from those who’ve used these technologies in production. It’s easy to find “getting started” tutorials, but harder to learn the “gotchas” around making it production-ready." Hope you have enjoyed learning more about Jacqueline! Stay tuned for our next blog where we share our experiences from the 2018 O’Reilly Fluent Conference. Follow GrapeCity on social media! 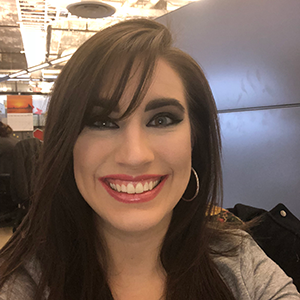 As GrapeCity's first socia media specialist, Caitlyn enjoys working with a creative team that is open to new ideas and learning about technology. When she's not keeping our social media channels up to date, she's reading, coloring, and going to the thrift store. Caitlyn has a Bachelor of Arts in Integrated Marketing Communications from Duquesne University, and she can be found on LinkedIn at Caitlyn Depp.